II-VI’s MLU96Z-series is an uncooled 980 nm pump laser module in a compact 3-pin micro-format package designed to meet the stringent reliability and power-efficiency requirements of ultra-compact amplification in current and next generation high bit-rate transceivers. 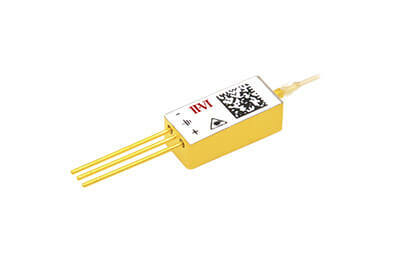 II-VI’s MLU96Z-series measures only 141 cubic millimeters in volume and features an 80 micron small-bend radius polarization-maintaining fiber pigtail to enable optical amplification within small transceiver packages. The MLU96Z-series consumes less than 0.5 Watt of power at the typical use conditions and up to 80 °C maximum operating temperature, addressing the critical power consumption requirements of pluggable transceivers.